I'm delighted to feature Aubrie Dionne on my blog again today. Author of Paradise 21 and the new book Tundra 37, Aubrie has imagined a fascinating future earth, and colonists who venture on centuries' long journeys to distant stars. The following is the prologue from Tundra 37, where the fascinating beings who pilot the spaceship Expedition to Paradise 18 are introduced. Abysme guides the vessel in silence, her blind eyes rolling as she senses our course, two hundred years away from Paradise 18. She’s scattered her thoughts among the stars, and her mind drifts farther from the sister I once knew. I fear the machine has engulfed her individuality. She’s forgotten the meaning of our goal, the oath we took three centuries ago. Most of all, she’s forgotten me, creating an emptiness inside me more profound than the desolation surrounding us. If I had my arms, I’d reach out to comfort her and usher her back from the black abyss spread before us. As children, I kept her alive through the destruction, signing us up for the Expedition and winning two tickets off Old Earth before it succumbed to hell. But can I save her now? I send impulses through my brainwaves and into the ship. Bysme, do you hear me? Unlike her, I have one operating eye and can see the control chamber we hang from. Twisting my head, I search her features. Her skeletal face twitches. She writhes and the wires holding her in place stretch taut. I wonder what I’ve done to us, the shock of our disembodiment jolting me. Every input hole drilled into my skull snakes with activity. The ship surges through me, a vast intranet of information, names, status charts, and infinite trajectories. If I couldn’t feel the cold, regulated air on the remnants of my torso, I’d be lost in the machine too. I remind myself of our mission and the perseverance flows into my veins. She doesn’t respond and the fear wells up from within me. Can I guide the ship alone? I realize I’ve left her at the helm for too long while I drifted into memories. Status of Beta Prime? Bysme speaks in monotone computer speech as she turns to the corner of the main control deck where the orb glistens, tempting us with the mysteries hidden in the cosmic swirls within its core. Sometimes, I wish we’d blasted the ball off the hull after its tendrils attached to the outer frame instead of recovering it for study. We’ve guarded it for so long, Project Beta Prime has become part of us, yet we’re further than ever from unlocking its secrets. All I know is the insistence of my memories, like ghosts that refused to be ignored. Unchanged. The weight of my voice in our mindspeak reflects my disappointment. Like everything else. Bysme falls silent, and I scan the systems searching for answers that aren’t there. But how is the gene-pool of these colonists kept vibrant and strong over hundreds of years of interstellar travel? Meet Genne, the Matchmaker. Names trailed in pairs along the wallscreen as the next batch of destinies unfolded. Gemme pulled her hair into a ponytail and sipped her synthetic coffee, reviewing the computer’s choices. Beside her, a constellation of stars glittered on the sight panel. She studied the spherical pattern, content to watch the world float by from the safety of the Expedition’s computer analytics wing. She’d live and die on the decks of the aging transport ship. The certainty of her fate comforted her from the black void pressing in. Consistency gave her solace, and in her life regularity reigned. She lived through her work, finding life in numbers. After another long sip, she gazed up at the screen and read the first pair of names. Aaron Tixton and Cassandra Smith. She accessed their profiles with the tip of her finger on her keypad. Both Lifers tested well in energy maintenance and ship repairs. Their personalities were type ISTP and type ENFJ, and their family trees didn’t intersect until third cousins in the first generation, providing a promising match. Neither showed any manifestation of the rare hypergene they’d searched for since they left Earth, but no one she’d ever matched had. There were no guarantees the Seers would last until the ship reached Paradise 18. Suppressing a moment of worry, she scratched her chin, then typed an affirmation on the touchscreen. Ray Ellis and Melissa Stewart. Although they were three years apart, Ray being the senior, their genes were optimally compatible. With resistance to Alzheimer’s, cancer, and heart disease, they would produce durable children. The touchscreen flashed as her finger pressed enter. The portal beeped, interrupting her work. Who would visit so early on the first morning shift? She’d dragged herself out of her sleep pod for a reason. The Seers expected the next report by fourteen hundred, and she didn’t have time for unplanned meetings. Gemme sighed and clicked off the screen. If you want to know more, you'll have to read the book. Suffice it to say, spaceships and love are both subject to changes of course. 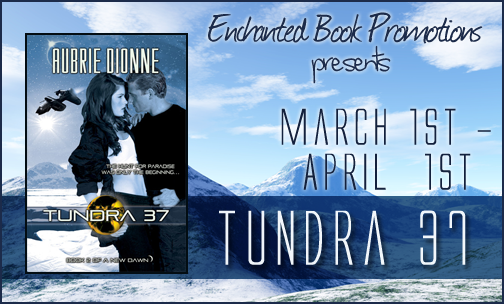 Thank you for hosting me and for writing such a nice review of Tundra 37!!! This sounds like a fascinating book with intriguing characters and premise.